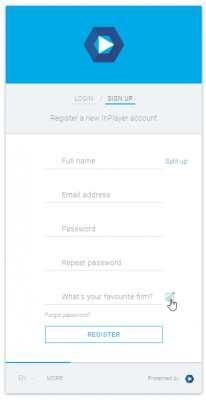 In the following guide, you will get more familiar with the Auth tab of the InPlayer Dashboard Settings. 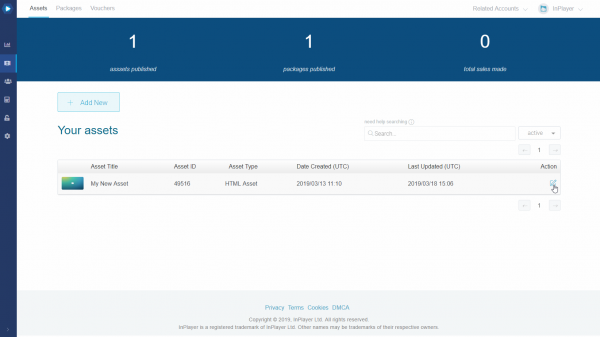 The Auth tab is where you’ll set up the authentification and restriction settings for your assets. This includes things like enabling your customers to use their social accounts to register and log in, limiting the number of devices they can watch on using the same account, adding geo and domain restrictions and more. The Auth section has multiple tabs: Social Auth, OAuth & SSO, Concurrent Sessions, Geo Restrictions, Domain Restrictions, and Custom Fields. 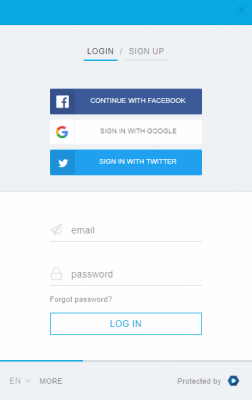 In the Social Auth tab, you can let your customers use their Facebook, Twitter, or Google accounts to register and log into your platform, instead of them using the standard paywall register and log in forms. 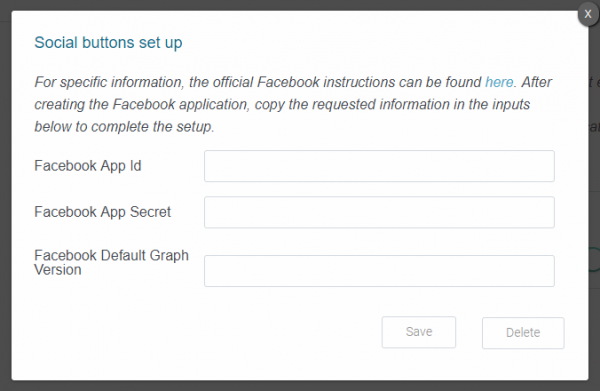 To enable or disable the social logins, just click on their respective toggles. Once enabled, the social login buttons will appear on the paywall. 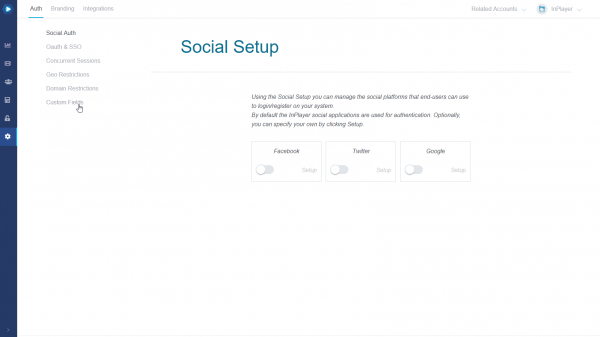 By default, our platform will use our own social apps to manage the customer logins, but you can also use your own apps by clicking on Setup and setting them up. OAuth and SSO are two features of our platform that can be very useful if you have content across multiple websites (domains). 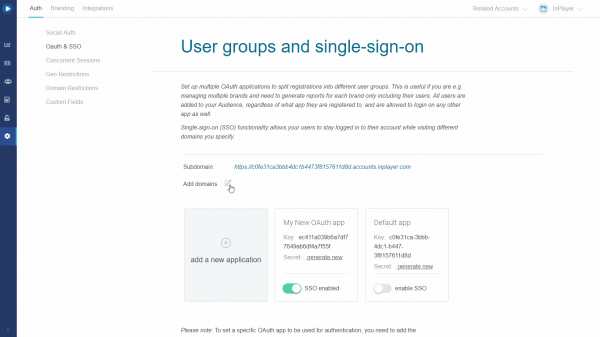 With the OAuth feature, you can group the customers from one website into one user group (called an OAuth app or application), and the ones from another website, into another group. This can be very useful when making reports because you will have an easy way of seeing how many people registered on each of your websites. To use the OAuth feature, you first need to create the user groups into which your customers will be divided. We call these user groups OAuth apps. 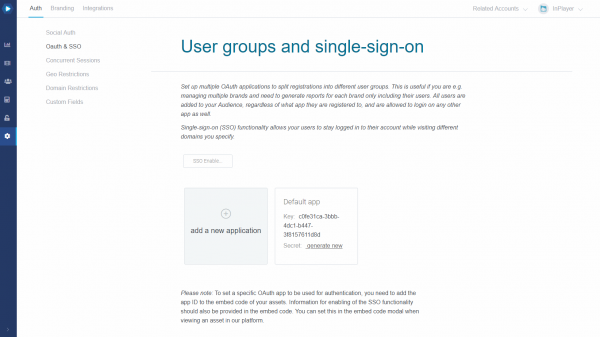 You can then attach an OAuth app to each of your assets, so whenever a customer registers an account on that asset, they would become a part of that user group. You will notice that you already have one OAuth app, i.e. the Default app. This is the default group to which all the customer registrations and login records will go to. To create a new OAuth app, click on add a new application. Give your new app a name (you can use the name of your website for example), and click . You can add as many OAuth apps as you want. Using the OAuth feature is very simple. All you have to do is choose the OAuth app you want to use for an asset, while you are getting the embed code for that asset. In the Assets tab of your InPlayer dashboard, go to the asset to which you wish to attach an OAuth app, and open it by clicking . 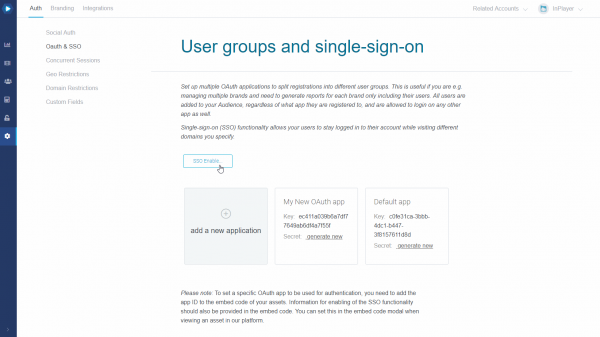 Select the OAuth app you wish to use. With that, every time a customer registers or logs into that asset, they will be grouped into the user group of the selected OAuth app. Once you set up the OAuth app, you can embed the asset on your webpage like you normally would. 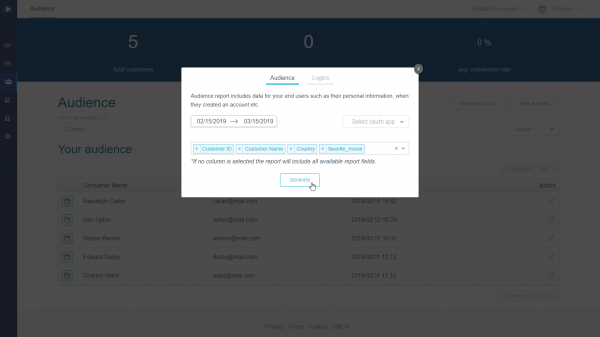 With the SSO (Single-Sign-On) feature, you can make it so whenever a customer logs into one of your websites, they will automatically be logged into all of your other websites as well. This greatly streamlines the customer experience. 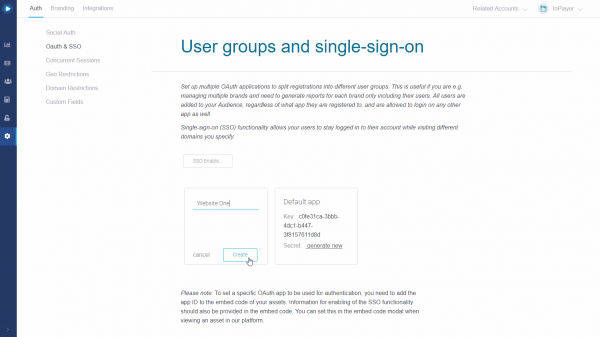 The SSO works as an extension of the OAuth feature, which means you have to attach an OAuth group on an asset to be able to use the SSO for it as well. To enable the SSO feature, first click on . 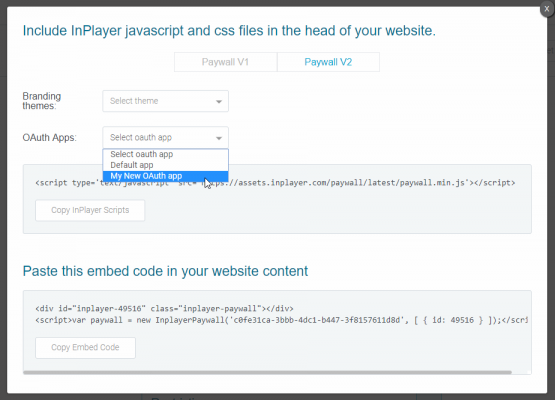 You can now enable the SSO feature for all your OAuth apps. To do this, just click the enable SSO toggle on the OAuth app. With that, the SSO is activated for that OAuth app. 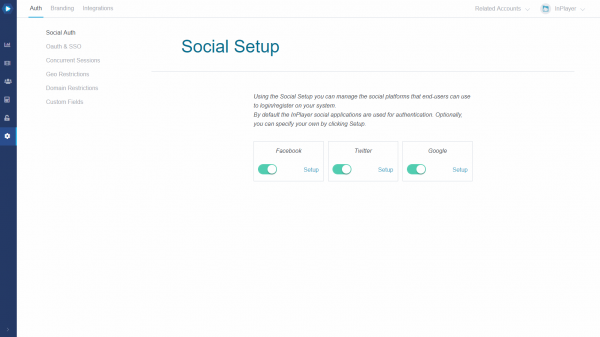 Every time you set up an asset to use that OAuth app, you will have the option to enable the SSO feature for it as well. We will see how to do this further down in this article. But first, you need to add the domains on which your customers will be automatically logged in as soon as they logged into just one. To do that, click on the button next to Add domains. Type in your domain and click . Make sure you do not add a / at the end of the domain, nor any other special characters. You can add as many domains as you wish. 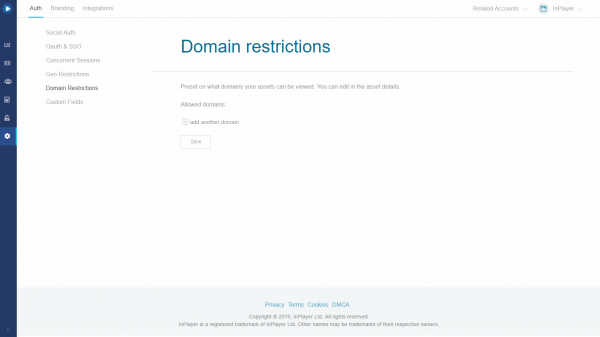 If you ever wish to remove a domain, just click the button next to it. Using the SSO feature is very simple. All you have to do is enable it in an asset when you are getting the embed code for it. In the Assets tab of your InPlayer dashboard, go to the asset for which you wish to activate the SSO, and open it by clicking . Once you select the OAuth app, you will see a Sso enabled: toggle right next to it. To enable or disable the SSO, just click on the toggle. If you don’t see the toggle, go back to the OAuth & SSO tab and make sure the SSO feature for the OAuth you are using is enabled. 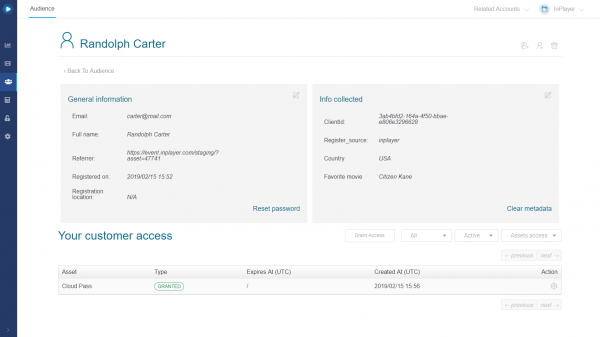 With that, every time a customer registers or logs into that asset, they will be logged into all domains (websites) that you’ve added in the SSO settings. 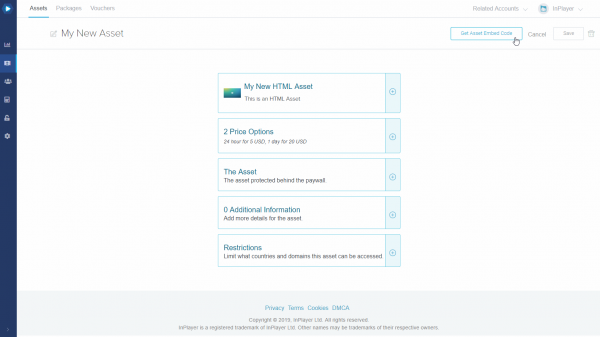 Once you set up the SSO, you can embed the asset on your webpage like you normally would. 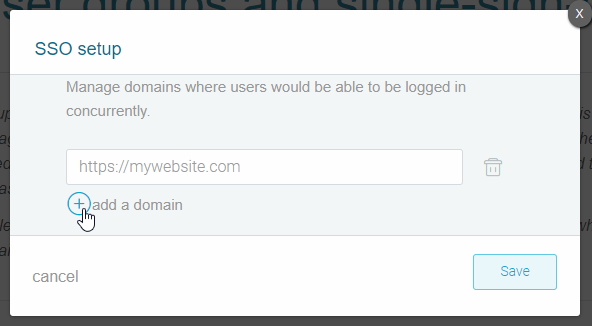 You can disable the SSO feature at any time by going to the OAuth & SSO tab and clicking on the SSO toggle. In the Concurrent Sessions tab, you can limit how many login sessions your customers can have when using a single account, thereby preventing the sharing of credentials. This is left as blank by default, which means your customers can have an unlimited amount of sessions. To limit the session, just enter the maximum number of active sessions in the field. As soon as a customer surpasses that number, they will be logged out of the first session they’ve logged into. The log out will happen immediately, without the need for the customer to refresh their page. In the Geo Restrictions tab, you can restrict the availability of your assets based on the customer’s country. 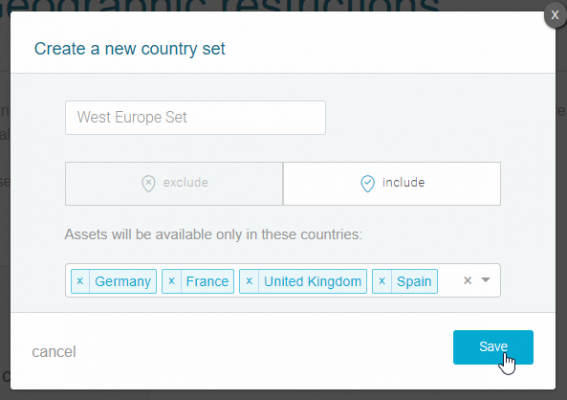 To create a new country set, click on create new set. 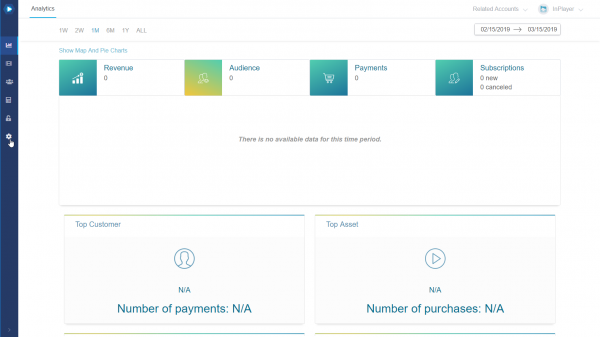 You can either include a set of countries, thereby making the assets only available there, or exclude a set of countries thereby making the asset available everywhere but there. Set everything up and click . 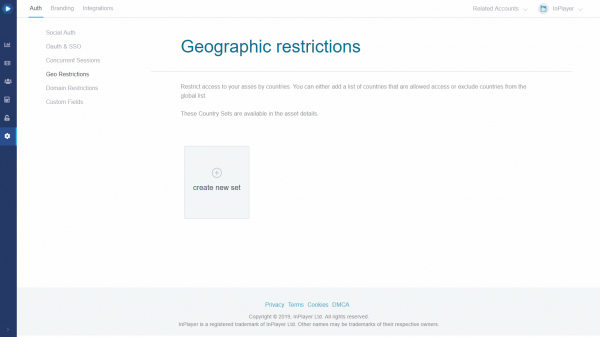 After you create a country set, you can use it in your assets by selecting it in the Restrictions block of the asset settings. 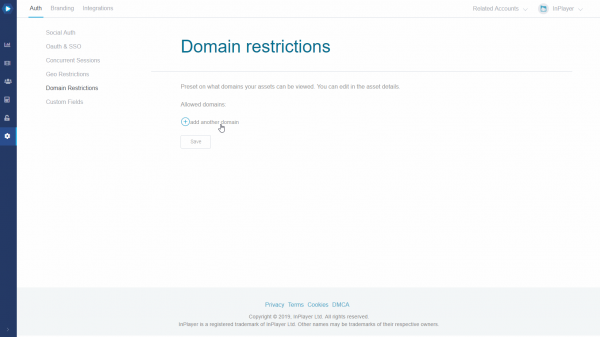 Similar to the Geo Restrictions tab, in the Domain restrictions you can restrict the availability of your asset based on a domain. 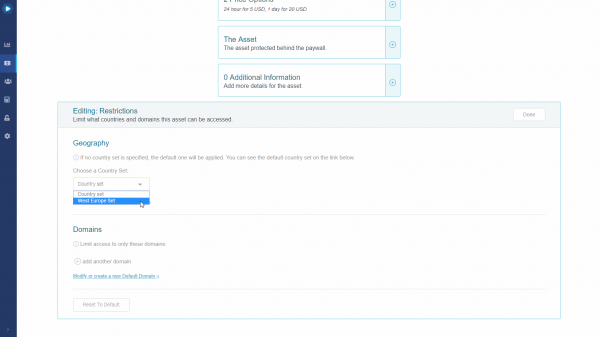 This means that your assets will only be embeddable on domains specified by you. To add a domain, click on add another domain. Enter your domain and click . Custom Fields are additional fields on the paywall’s registration form. They can be used to gather all kinds of metadata from our customers. These details will help you discover, identify and describe your customers, and understand their connection and feelings about your product or service. Log into your InPlayer merchant panel and go to Settings. Then go to the Custom Fields tab. To add a custom field, click . 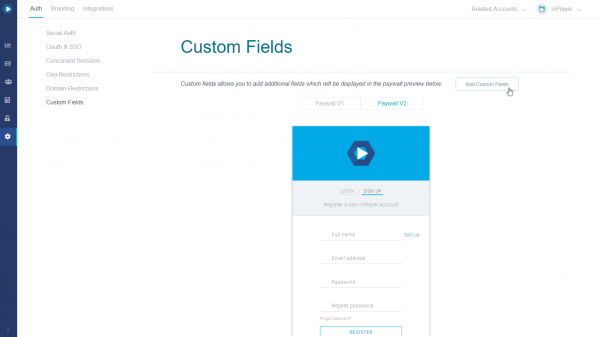 There are 5 different types of custom fields. 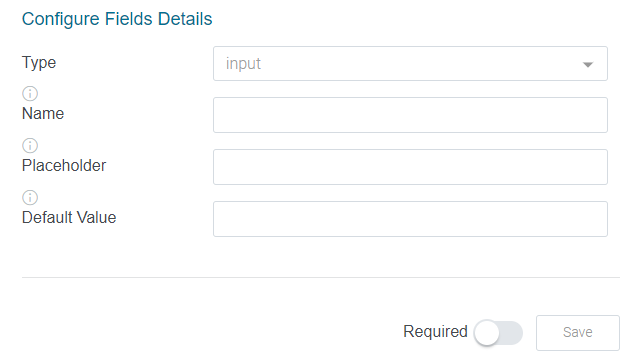 The Input field is where your customers can type in text. Name – This is the name of the field which is stored in the database. Your customers will not see this. 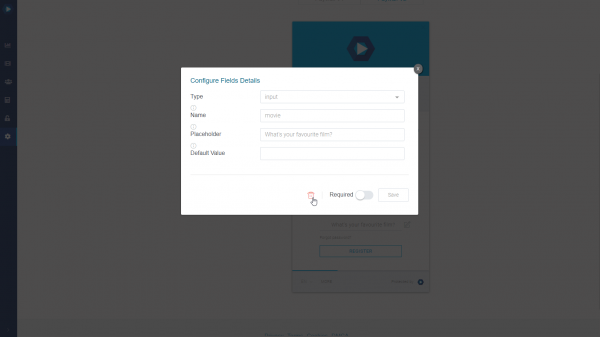 Placeholder – Here you can type in a short description that will tell the customers what they should enter in the field. Default Value – This is going to be the default text in the field. You can leave this blank. The Dropdown field lets you add a drop-down menu to the registration form. Placeholder – Here you can type in a short description for the field. Select Options – This is where you add the drop-down menu entires. Enter Option Key – This is the title of the entry that will be written in the database. Your customers will not see this. Enter Option Label – This is the title of the entry that will appear on the paywall, and what your customers will actually see. Once you set up an entry, make sure to click the button on the right of it to save it. You can add up to 30 entries. 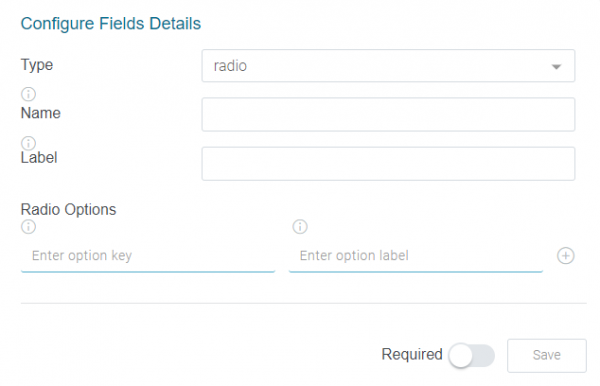 The Radio field lets you add a set of multiple options from which the customer will have to select only one. Label – Here you can type in the description or title of the field that your customers will see. Radio Options – This is where you add the multiple options. Enter Option Key – This is the title of the option that will be written in the database. Your customers will not see this. 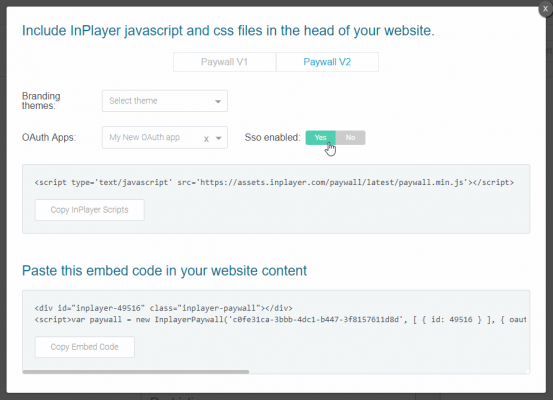 Enter Option Label – This is the title of the option that will appear on the paywall, and what your customers will actually see. Once you set up an option, make sure to click the button on the right of it to save it. 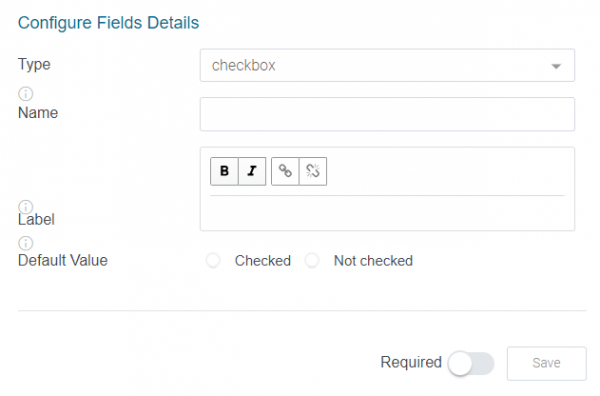 The Checkbox field lets you add a checkbox. Default Value – Set whether the field will be checked or unchecked by default. A very useful feature of the Checkbox custom field is that you can add a hyperlink to the Label text. To do this, select the text you want to hyperlink to and click . With the Country field, your customers can select their country. 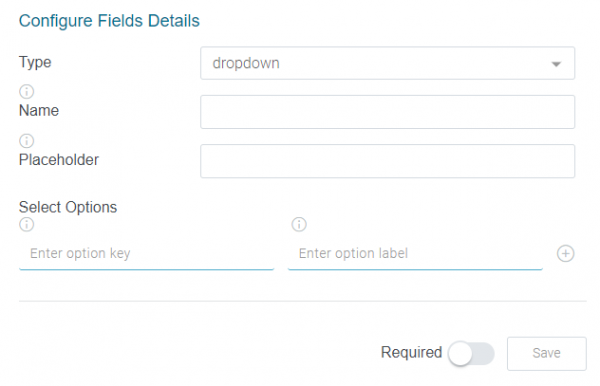 For each of the custom fields, you can set up whether they are going to be required or non-required, by toggling the slider next to the button. Once created, the custom fields can always be modified. To do this, just open the field you wish to edit by clicking on the button next to it. To remove a custom field, just open it, and click the button. 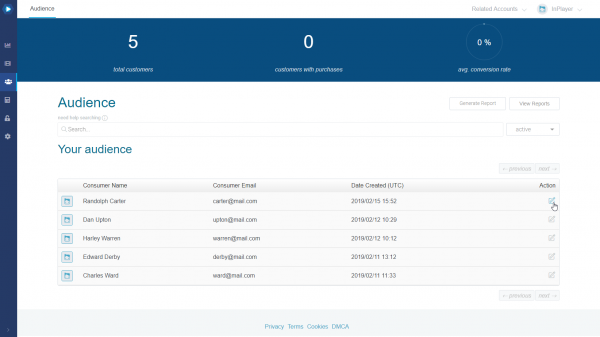 The customer metadata gathered from the custom fields can be accessed and exported at any time. To do this, go to the Audience tab of your InPlayer dashboard. To get the customers’ metadata, just click on the button in the Action column on the customer’s row. In the Info collected section, you can see the metadata that was gathered from the customer upon registration. Additionally, if you want to export the data for a report, you can always do so by clicking on in the Audience tab. Here, in Select report columns, you can select all the fields you wish to include in your report, along with the timeframe for it. To view the report, click on .